If you have ever asked, what are the benefits of taking acai, you'll find that there are many. This reddish-purple fruit from Central and South America is related to the blueberry and cranberry. Some companies make inflated health claims about this nutritious berry. Most claims are not backed up scientifically. However, there are a few studies that have shown this fruit to be rich in many vital nutrients. The key is to look at the facts and ignore the hype. Acai has been proven to be rich in antioxidants which may help protect you from heart disease and cancer. Also rich in anthocyanins and flavonoids, acai may help to slow the aging process by fighting free-radicals. Red, blue and purple fruits are known for this, but acai is especially powerful. Acai berries contain 30 times the anthocyanins of red grapes! Even though it is often touted as a weight loss product, there is little scientific evidence to support this. However, the addition of healthy fruits, including acai, to your weight loss plan is always a good idea. Acai berries have many vital nutrients that support weight loss goals. Because of its outstanding antioxidant benefits, acai oil is often used in beauty products such as moisturizers, cosmetics, shampoos and conditioners. Even when these products sit on a shelf, the antioxidant properties do not degrade. When you have a serving of acai, whether in juice or supplement form, you are actually getting more protein than you do in a single egg. The best part is that you get zero cholesterol with that protein. How's that for a great benefit? What are the benefits of taking acai? 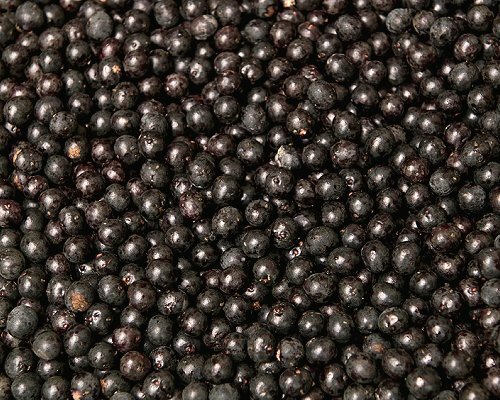 In studies done by Dr. A.G. Schauss, it was discovered that acai berries actually contain traces of all known beneficial minerals. Additionally, acai is believed to contain more trace elements than any other food. Sufferers of arthritis or other joint problems will be happy to learn that acai is high in glucosamine. Glucosamine is essential for healthy cartilage. Healthy cartilage means less joint discomfort. The only potential side effect is if you have a pollen allergy. You may also have an allergy to acai in large quantities. Overall, acai is perfectly safe. What are the benefits of taking acai? Find out more by reading Acai Berry Supplements, Acai Juice and Benefits of Acai.